State Dept official says US will oppose expansion regardless of nuclear talks, in apparent response to Netanyahu's warnings. East even if a nuclear deal is reached, in an apparent attempt to play down Prime Minister Binyamin Netanyahu's warnings in his Congress address. US Secretary of State John Kerry will travel to Saudi Arabia on Wednesday to try and reassure US Gulf allies that an Iran deal would not mean Washington would turn a blind eye to the Islamic Republic's regional ambitions, reports AFP. "Regardless of what happens in the nuclear file, we will continue to confront aggressively Iranian expansion in the region and Iranian aggressiveness in the region," the official said. His comments came as several sources in Arab states sided with Netanyahu and urged Obama to changed his policy in the Middle East, which they say has allowed Iran to expand its control. Iran is helping prop up Syrian President Bashar al-Assad, is supporting Houthi Shi'ite rebels who have seized Sana'a and are taking control of Yemen, is taking an ever more active role in Baghdad leading the Iraqi fight against Islamic State (ISIS), and has long held power in Lebanon through its terror proxy Hezbollah. "You can't read into the nuclear negotiation any kind of determination of where the US relationship with Iran may go in the future," the senior State Department official told reporters. The official said Washington is working closely with its majority Sunni Muslim Gulf allies to help build up their security and capabilities to defend their interests. "Obviously the Gulf states are watching the negotiations very carefully, they have a legitimate reason to want to understand better what it is we're trying to achieve," the official stated. 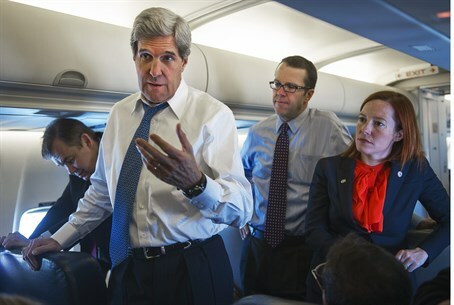 But he stressed: "This is not going to change any of the other aspects of our approach to Iran." It was revealed recently that Obama has made numerous overtures to Iran trying to turn the Islamic regime that is seeking nuclear power into an ally, including via private letters to Iranian Supreme Leader Ayatollah Ali Khamenei. Iran is busy gobbling up the nations." "We must stand together to stop Iran's march of terror," he said to thunderous applause.